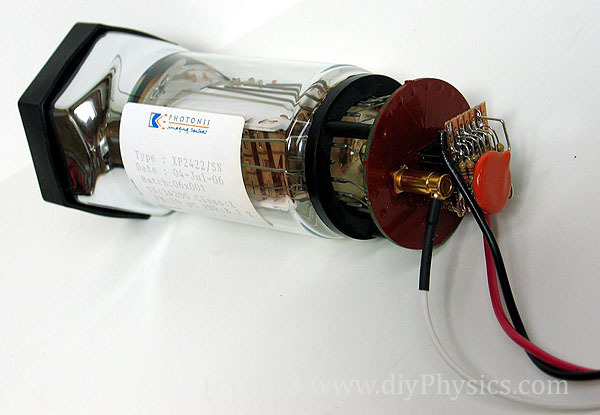 The surplus XP2422/SN tubes have a printed circuit board that was wired by Photonis directly to the base of the tube. This board has a SMB connector to output the PMT’s anode AC-coupled signal. The PCB also holds capacitors to stabilize the voltage divider for the last dynodes, and a 14-pin connector that is wired in the gamma cameras in which these PMTs were supposed to be installed to a separate assembly containing the voltage divider string and a high-voltage power supply. We traced back the wiring and were able to recreate the pinout for the 14-pin terminal. We constructed a voltage divider assembly on a piece of Vectorboard. Two 7-pin female headers (0.1″ inter-pin spacing) interface the board to the XP2422/SN 14-pin connector. Our technical note presents the value of the components and their connections.